To Infinity and beyond: The latest (and biggest) Avengers film gives Marvel die-hards plenty to chew on. As devoted readers of superhero comic books know, no one ever stays dead in the Marvel universe (or the DC universe, for that matter). That's a helpful, but also somewhat disheartening, lesson to keep in mind while watching Avengers: Infinity War, the massive crossover event featuring superheroes from (almost) all of the movies in the Marvel Cinematic Universe. Marketed as the culmination of a decade's worth of big-screen superhero adventures, Infinity War is essentially all climax, jumping right into the action and never letting up for two and a half hours. With so many characters crammed into the story, there's pretty much no time for quieter, more reflective moments, or for building on the relationships that have been cultivated in the previous MCU movies. There is plenty of time for huge superhero battles, though, and for the geek-out moments that fans will go crazy for, seeing all their favorite characters interacting, many for the first time. 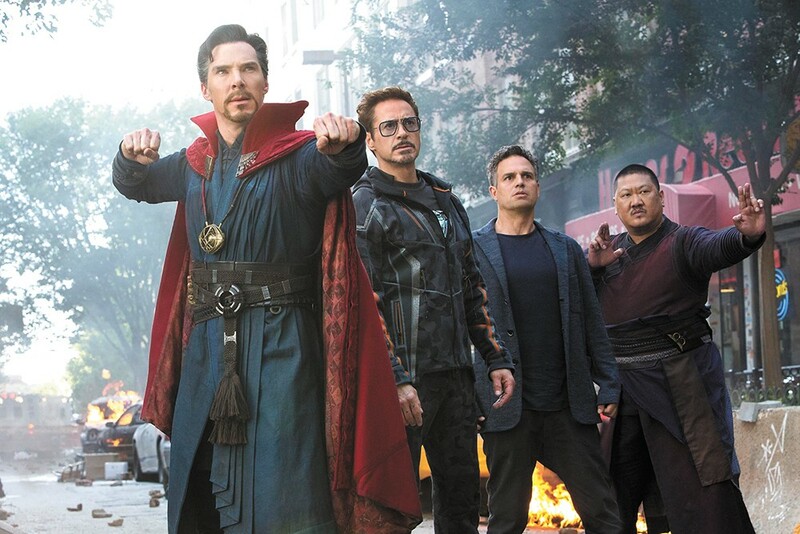 The heroes must come together to oppose intergalactic villain Thanos (played via motion capture by Josh Brolin), who's been popping up briefly in Marvel movies since 2012's original Avengers, collecting six powerful gems known as the Infinity Stones that will allow him to have ultimate power over the universe. Thanos is a stronger villain than many of the MCU's notoriously forgettable antagonists, although it doesn't help that trickster god Loki (Tom Hiddleston), the best MCU villain, is only around for one scene. Thanos possesses a degree of pathos thanks to Brolin's soulful line readings, and there's a sort of haunted, regretful quality to his plan to wipe out half of all life in the universe, but he's still not as fun to watch as Loki, Killmonger or Vulture. Thanos may actually have the most substantial character arc in the movie, thanks to his complex relationship with his adopted daughter Gamora (Zoe Saldana). Infinity War is as much a Guardians of the Galaxy movie as it is an Avengers movie, and Gamora and her fellow space-faring heroes get a lot of screen time, although screenwriters Christopher Markus and Stephen McFeely aren't as adept at writing the Guardians' quippy dialogue as writer-director James Gunn is in the main Guardians movies. Markus and McFeely do throw in some welcome bits of humor in the banter among the various heroes, especially between MCU elder statesman Tony Stark (Robert Downey Jr.), and both his young protégé Peter Parker (Tom Holland) and his reluctant ally Dr. Strange (Benedict Cumberbatch). The actors mostly know how to make their somewhat limited screen time count, even if some big names (including Chris Evans' Captain America) get lost in the shuffle. Marvel has created such high expectations for the integration of all its characters that some fans may be disappointed that not every obscure (or even major) character gets to make an appearance. It would be awesome to see characters from the entire MCU, including the neglected TV division, onscreen at once, but that would be a photo op and not a narrative. The original print version of this article was headlined "Avengers Keep on Assembling"